In addition to providing exercise and a chance to pee and poop, walks are full of opportunities for your dog to learn about the world and develop good behaviors. An enriching walk will also help tire out a dog out both mentally and physically, which can result in better behavior during the inside portions of the day. Here are some ways to make walks as fun as possible for both canines and humans. Most dogs are natural-born scavengers. They love the thrill of discovering something really great to put in their mouth on the sidewalk. Finding a discarded chicken bone is the equivalent of winning the doggie lottery. Make your dog feel like a winner by tossing treats periodically in front of you, and then give him the cue “Find it!” to let him know that the hunt should begin. This game can help you control scavenging; better that your dog satiate his treasure-hunting needs by finding the bits of jerky you’re tossing than by pulling your arm out of its socket so he can get to a half-eaten bagel. It is hard for humans to even begin to comprehend what a dog’s sense of smell is like. It’s thought to be as much as 10,000 times better than ours. Needless to say, this means that smells are incredibly important to them. So, when your dog stops to sniff yet another lamp post, let him have a moment to really fully enjoy it. Think of pee as a dog’s way of communicating with other canines in the neighborhood. It’s like he’s checking Facebook. It’s his pee-mail. The information he’s taking in is a lot for a doggie brain to process, but that’s a good thing. Wouldn’t you rather he fatigue himself trying to comprehend the vintage of a particularly stinky specimen on a fire hydrant than use that same energy to redesign your sofa pillows? You might be the coolest thing in your apartment. But, outside, it’s a different story. Compared to the hustle and bustle of the NYC streets, a human on the end of a leash is B-O-R-I-N-G. 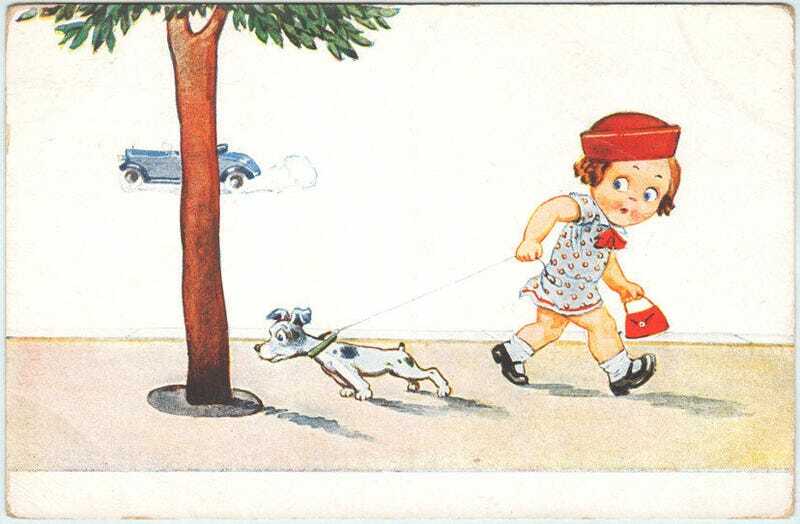 Picking up the pace can result in better loose-leash walking outside. If your dog is focusing on keeping up with you, he is going to have a harder time pulling ahead. Periodic swift changes in direction can also make sure he always has at least some of his focus on you, since you’re the one deciding on the direction of traffic. A speedy U-turn can also mean a dog who is out in front of you is now a pace or two behind you. This can make a dog who is in doubt of where to be on the street hedge his bets and stay close to you at all times. Pick a marker on the street— something you’re sure to see at least once a block, like a tree or a car bumper. When you get to the marker, if your leash is loose and your dog is paying attention to you, mark the moment with a click or a “Yes!” and then give a treat at your knee or on the ground near your foot. Rewarding in these spots will encourage your dog to default to being near those areas when walking. Start out with a marker you’re sure to see at least a few times per block: Cracks in the pavement or fire hydrants or store awnings. Later on, you can pick something slightly less common, like treating at every Starbucks. The best tool humans have to keep dogs safe on the street is something unique to our species: Verbal language. Always ask other dog owners if it is safe for your dog to greet their dog, and speak up quickly if you don’t think your dog can politely say “hi.” When in doubt, keep greetings short and sweet. Keep an eye out for loose, wiggly body language. These are generally signs of friendliness; stiffness and staring are usually signs that one dog or the other isn’t comfortable. Social interactions with other dogs are an important part of most every dog’s life. But it’s crucial that they everyone be safe. It’s also a good thing for your dog to meet new people on the street, but these greetings should also be managed so they’re appropriate. If you have a dog who is a jumper, get down low to be near the ground with your dog when someone approaches—you can hook your finger in your dog’s collar to help reduce jumpiness—and ask the stranger to get down low too. If your dog is fearful of new people, ask the person to toss a treat on the ground. This will help your dog have good feelings about new people approaching.